I’ve said it before and I’ll say it again – what keeps me writing this blog, even more than my love of writing and books, is the amazing (and growing) group of readers who not only read my posts, but like and comment on them and join in some great conversations. With this in mind, I am touched to have two other blogs nominate me for the Reader Appreciation Award, as I have received nominations from both The Obscured Dreamer and J. Keller Ford, both fantastic blogs that I strongly recommend you visit if you haven’t yet come across them in your travels through the blog world. As is quite often the case, the rules for this award differ slightly in the two interpretations I have seen (and I will probably break the rules anyway). As always, you need to link back to the blog that nominated you, include the picture of the award, and then nominated six more bloggers (I think I’m going to nominate a few lot more for this one). In one interpretation of the award you’re also supposed to mention what you’ve been up to lately. Geeze, where do I start? I guess with my health returning I have finally returned to work full time, and have found myself darting around doing all sorts there, working with some fantastically intelligent students who need to be challenged and pushed to new levels (I find myself so impressed and excited by these kids), as well as working with younger kids than I am used to (as we have a primary/junior school right next to the high school). Outside of this, I have been spending a lot of time with friends, listening to a lot of new music (speaking of which, I’ll update my music listening page after I publish this, for those of you interested), bracing myself to catch up on my 12 novellas challenge somehow, as well as trying to catch up with my reading. Oh and I’ve been watching a lot of Ross Noble’s latest stand up comedy DVD, which has three discs, six shows and hours of extras – the total running time is nearly twelve hours, which in itself is quite funny. If you’ve never seen this man’s comedy, you really must (he has a channel on Youtube called the Ross Noble Channel I think, full of clips from one of his Australian tours a few years back). His shows are completely unrehearsed and unscripted, and insanely funny – I dare say he is one of the most talented stand up comedians in the world at the moment (he is hugely successful in the UK and Australia, but I don’t know about outside these countries). Okay, now on to the readers I would like to pass this award on to. 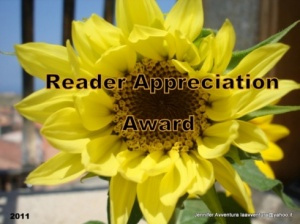 I am deeply grateful to all my readers of course, but these readers I am nominating have been extra amazing, commenting on my posts regularly, and being highly supportive of my blog as it grows. …and of course the two lovely ladies who nominated me for this in the first place! There are so many more blogs I could nominate for this, but I will stop there. If you haven’t visited these blogs, please do as they are all amazing. And if you have ever stopped by my blog, even only once or twice, or if you have liked or commented on anything on my blog, thank you, because you are awesome and you have in someway contributed to the continuance of this blog! I appreciate all of my readers, every single last one of you! Hope you all have a fantastic weekend! It’s raining here so I think it’s time to curl up with a book. This entry was posted in Awards, Stuff about me and tagged Awards, blogs, Books, Reader Appreciation Award. Bookmark the permalink. That’s not saying much, though. There’s a reason a lot of us love your blog. As long as you keep writing, we’ll keep reading. Deal? Thank you very much for including me on this incredible list! I am so happy to be part of the blogging community, I only hope to contribute as much as I receive. This is a tall order given the talented bloggers I follow such as yourself. Appreciation is a two-way street, so like Tanya said as long as you keep writing, we will read, like, and comment! Happy Jubilee weekend to you, and thank you again! Congratulations on the award! 🙂 And thank you so much for nominating me! 🙂 You just made my day! Aww thank you! Very nice to wake up to this! Thank you! 😀 I appreciate your writing too much to stop reading. 😀 Yay! Congratulations !! This is a wonderful news , and thank you very much for nominating my blog… I am deeply honored. Twelve novellas, oh my! Read Train Dreams! I want someone to review it. And I’m happy to hear youre back to work and saving for a grand adventure, I’m sure. Yeah, I know, I’m a lunatic trying to write twelve novellas. I’ve already promised myself that next year the only new things I am going to write will be a novel in November for NaNoWriMo, and something in April – I’m thinking of giving Script Frenzy another go but writing a different kind of script (last time I wrote a screenplay). The rest of 2013 will be dedicated purely to editing and rewriting the better stories among the 12 novellas and also the better of the (what will then be) 4 novels I have written. I also want to enter more short story comps next year. Geeze I’m too ambitious sometimes, it’s no wonder my health went sour a couple of months ago bahaha. And okay, I will try and remember to add Train Dreams onto my next book order. Remind me, nag me on Twitter so I remember (my memory is dodgy at the moment haha). Thank you so much! I can’t believe I didn’t circle back here to thank you after I saw the post. Bad, bad, bad blogger, bad. Sorry! thank you!! always a pleasure to follow your blog!! Thanks for the award. And my apologies for not commenting sooner. I’ve been in and out of town and I’m doing my best to catch up. I always love your content so it is fun to comment. And congrats on your award!